You are here: Home / Gold / Which are the best Gold Savings Scheme in India? Which are the best Gold Savings Scheme in India? With so much hype surrounding Gold as a must investment, a lot of reputed jewelers are offering savings schemes, but which are the best Gold savings scheme in India? Let’s have a look. Gold Savings Schemes or Gold Schemes, mainly work on a similar principle across all jewelers, where in you contribute a monthly amount as installments for purchasing gold ornaments with the jeweler (yes you can only purchase ornaments and not Gold bars or coins), and in turn the jeweler will contribute the last 1 or 2 installments on your behalf at the end of the tenure. So if you are entering in to an arrangement to contribute towards the scheme for a year, you pay 10-11 installments and the remaining 1-2 installments will be borne by the jeweler. This is good if you are planning to buy some gold jewelry in the next year or so and do not wish to make a big lump sum payment in one stretch. Before you think of putting money in Gold Savings schemes or Gold Plans, you should know that these are not ‘investment’ schemes and are purely savings schemes and come with their set of pros and cons that you can find here. Once you are aware of them and want to buy some gold ornaments, here are some of the better Gold schemes in India in which you can park your funds and make the purchase. Coming from the house of Tata, a name that is trusted for generations in our country is one of the more popular ones. Tanishq, the retail jewelry division of the company offers a scheme where in you pay 11 installments for 11 months and the last installment that is the 12th will be borne by the company and you then purchase gold jewelry for the entire amount. Minimum amount required is Rs. 500 and it can be increased in multiples of 500 there after. Again a well known name, their Gold Plan offers a scheme where in you pay all 12 installments, and PCJ adds 2 more to it at the end, effectively taking your savings to 14 months and you earn about 16-17% returns. So you can purchase gold jewelry for 14 months worth of money by paying for 12 months. A well known name for some time in the Indian markets when it comes to Gold and Diamond jewelry; they offer a Gold scheme wherein for Gold jewelry you pay for 12 months in installments and get 1 month installment from Gitanjali and you gain 2 months of installments for purchase of diamond jewelry. An Iconic name in the industry for decades, TBZ’s scheme, has a plan under which you can get not only gold but also diamond and Platinum Jewelry. You need to put in minimum of Rs. 1,000. It has installment tenures for 12, 15, 18 and 24 months. You get approximately 1 month’s installment amount as discount on 12 month scheme, 1 and a half month discount on 15 month scheme, 2 months on 18 months and 3 and a half month on 24 months scheme. It is worth considering as it is a well known brand and can be reliable. It has two types of schemes, or rather at least two scheme names with similar features, Malabar Monthly Installment Scheme and Wedding Purchase Scheme. These allow you to invest for a minimum period of 3 months in 3 installments and a maximum of 36 months and 36 installments. There is a feature under these schemes that allows you to lock the rate of Gold at the rate prevailing on the day of installments. You can gain 6% p.a. proportionately calculated based on your period of installments and amount paid. There a few others as well, and for all you know even your local jeweler may offer you similar or better Gold Plan. But do remember to be sure of them and whether or not they are reliable like the brands in terms of your money being secure and only then go for it. Does any of them offer Gold COINS instead of Gold Jewellery ? How do i pay online for the monthly scheme…?? Once you take an Online Scheme for Gold, you can pay either by Cheques, Online Transfers, Post Dated Cheques or you can have an ECS done, by which the alotted amount will be debited from your account at the said interval. Hope this helped. 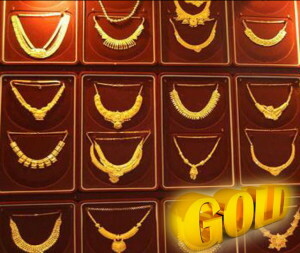 Monthly scheme for gold varies from jeweler to jeweler. But by and large the idea is same, you invest regularly once every month for a year or two years and the jeweler sets aside that value of gold jewelry for you. The benefit is incase of an immediate requirement of gold jewelry in the near future like an upcoming wedding or some function, then you don’t have to spend a big amount in one go. But from an investment point of view it is not that great since it will buy you gold jewelry and that is after the cost of making charges is added to the overall value of gold and hence you get less value of gold. It is also good if you like buying gold jewelry but don’t like spending too much in one go.